Greece is near West Asia, and at the edge of Europe. Being outsiders, though, has given people who live there more freedom to experiment with new ideas and new ways of doing things, to combine old ideas in new ways. A lot of new ideas – like organized troops of soldiers, democracy, theater, and logical proofs – have come from Greece. 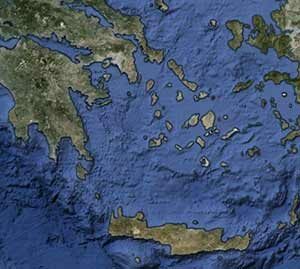 People first began to move to Greece about 55,000 BC (57,000 years ago). By about 6000 BC people in Greece began to farm their food and settle down in villages. Then there began to be more and more people living in Greece. Sometime around 2000 BC, Indo-European invaders came to Greece from Central Asia, bringing with them the use of bronze, the potter’s wheel, and the Greek language. These invaders married the local people. They sailed around and picked up ideas from West Asia and Crete, and by about 1400 BC they were building palaces and big tombs for their leaders. This is the time of the Trojan War. But by about 1200 BC West Asia and Egypt fell into an economic depression, and the Greeks fell with them. Many Greeks left Greece and sailed to new homes in Israel (where they are the Philistines) or other places in West Asia. By about 900 BC, the Dark Ages were ending, and the Greeks began trading with West Asia and Egypt again. From the Phoenicians, the Greeks learned the alphabet: this is the time of Homer. There were more and more people in Greece. People began to form city-states and experiment with different kinds of governments for them: oligarchies and tyrannies. This is the Archaic period; it ends about 500 BC when the Athenians try a new experiment in government: the world’s first democracy. In the Classical period, people around the Mediterranean noticed that the Persians had formed the world’s first big empire (and used it to attack the Greeks in the Persian Wars). Everybody wanted to form an empire too – the Romans, the Carthaginians, and the Greeks. The Athenians built an empire, but the Spartans destroyed it in the Peloponnesian War. This is the time of Socrates and Plato. After the Peloponnesian War, in the Hellenistic period, Greece was much weaker, and by 336 BC Greece became part of Philip of Macedon’s empire. 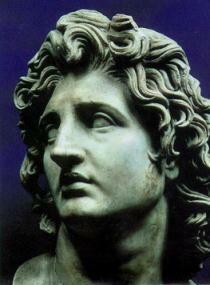 Philip’s son Alexander kept Greece and then conquered the Persian Empire before dying in 323 BC. After Alexander’s death, Greece was never strong enough to form her own empire again, and instead by 146 BC became part of the Roman Empire. When the Roman Empire fell in 476 AD, Greece continued to be part of the Byzantine Empire, and then transitioned in 1453 AD into the Ottoman Empire. Oxford First Ancient History, by Roy Burrell and Peter Connolly (1997). Lively interviews and pictures make the ancient Mediterranean come to life. For teens. The Oxford Illustrated History of Greece and the Hellenistic World, by John Boardman, Jasper Griffin, and Oswyn Murray (2001). For college students. A Brief History of Ancient Greece: Politics, Society, and Culture, by Sarah Pomeroy and others (2004). This one might be a little more politically progressive than the Oxford history. Cite this page: Carr, K.E. Greek history – Ancient Greece. Quatr.us Study Guides, July 7, 2017. Web. April 19, 2019.